The heart of any abrasive waterjet nozzle is the jewel orifice that forms the waterjet stream. These are generally made from a synthetic jewel—usually sapphire, ruby or diamond. Traditionally these jewels have a square-edged orifice, but some nozzle manufacturers offer round-edged jewel orifices for various manufacturing and service reasons. In all cases the actual effective diameter of the waterjet stream is slightly smaller than that of the orifice itself because of the physics of fluid flow through a hole. You can see this effect in the drawing below, which shows three different diameter orifices resulting the exact same diameter jet streams. This effective reduction in stream cross-sectional area is expressed by something we call the “discharge coefficient” or “orifice coefficient”. 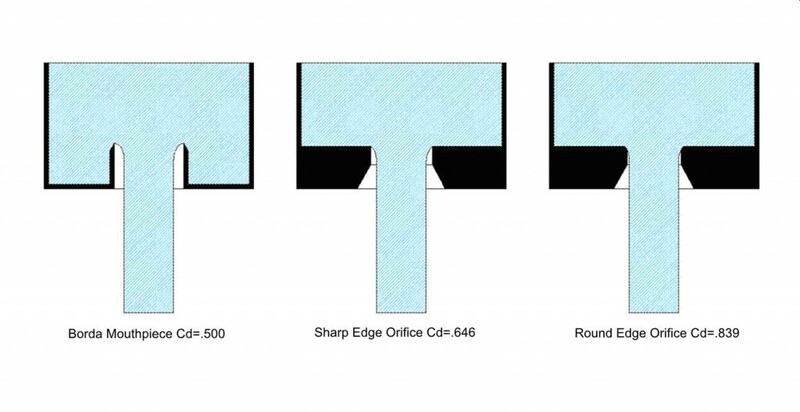 A round-edge orifice has a slightly higher “discharge coefficient” than a square-edged orifice. This means that the jet stream leaving a round-edged orifice is slightly larger than that leaving a square-edged orifice of the same diameter, which in turn means that the volume flow rate is also slightly greater and so the effective hydraulic horsepower is greater. However, please do not think that this means that a round-edged orifice is more efficient or that it magically produces more power from the same pump. In the world of physics you never get something for nothing. If a pump is operating at maximum output using a square-edged orifice and you wish to change to a round-edged orifice, you will need to go to a slightly smaller orifice size to avoid overloading the pump. Similarly, if you are currently using a round-edged orifice and desire to change to a square-edged orifice, you will find that you can operate a slightly larger orifice without overloading the pump. In either case, the effective power at the nozzle will be the same. Alas, there is no free lunch!